A Delta Air Lines Boeing 777 in the carrier's most-recent livery. Delta Air Lines will add a new route to Asia from its hub at Minneapolis/St. Paul (MSP). The carrier announced on Wednesday that non-stop flights connecting MSP to South Korea’s Seoul/Incheon airport would begin sometime next year. Delta did not reveal a specific start date, but its plans for a Minnesota-Seoul route follow the recent final approval for a joint-venture partnership with South Korean carrier Korean Air. Such partnerships exempt participating carriers from antitrust laws, allowing them to coordinate flights and fares while also selling seats on each other’s flights. Delta has a number of other joint-venture partnerships, including with AeroMexico, Air France-KLM and Virgin Atlantic. The "JV" with Korean Air will give Delta new options to sell seats in Asia thanks to Korean's hub in Seoul. Delta Air Lines' first Airbus A321 narrow-body airplane rests outside a company hangar at Atlanta's airport on April 29, 2016. The nose of a Delta Air Lines Airbus A330-300, seen at the airline's Atlanta hub on April 29, 2016. Several Delta Air Lines jets rest outside a hangar at the company's Atlanta hub on April 29, 2016. A Delta One first class seat, seen on April 29, 2016 at Atlanta Hartsfield-Jackson International Airport. Delta Air Lines jets at the company's Atlanta hub on April 29, 2016. Workers at Delta Air Lines' TechOps facility change an engine out on an MD-88 jet on April 29, 2015, at Atlanta Hartsfield-Jackson International Airport. Members of the media take photos of Delta Air Lines jets outside a hangar at its Atlanta hub on April 29, 2016, during the company's media day. Delta Air Lines' logo, seen inside an Airbus A330 long-haul jet, at Atlanta Hartsfield-Jackson International Airport on April 29, 2016. The first class cabin, on board Delta Air Lines' new Airbus A321, is seen during the company's media day at Atlanta's airport on April 29, 2016. A member of the media checks out Delta Air Lines' new Airbus A321 aircraft during a tour at the airline's Atlanta hub on April 29, 2016. The economy class cabin, on board Delta Air Lines' new Airbus A321, is seen during the company's media day at Atlanta's airport on April 29, 2016. A member of the media checks out Delta Air Lines' new Airbus A321 aircraft during a tour at the airlines' Atlanta hub on April 29, 2016. The economy class cabin of Delta's new Airbus A321 is seen during the company's media day at Atlanta Hartsfield-Jackson International Airport on April 29, 2016. A Delta crew member serves lunch to members of the media during a tour of the carrier's new Airbus A321 aircraft on April 29, 2016 at Atlanta's airport. Lunch is served to members of the media during a tour of its new Airbus A321 aircraft on April 29, 2016, at Atlanta Hartsfield-Jackson International Airport. First class seats, seen aboard a Delta Air Lines Boeing 737-900 during the company's annual media day at its Atlanta hub on April 29, 2016. First class seats are seen here on a Delta Boeing 737-900 during the company's media day at its Atlanta hub on April 29, 2016. Coach class seats are seen on a Delta Boeing 737-900 during the company's media day at its Atlanta hub on April 29, 2016. A Delta Air Lines Boeing 737-900, fresh from the factory in Seattle rests outside a hangar at the carrier's Atlanta hub on April 29, 2016. Members of the media find refuge in the shade provided by a Delta Boeing 757-200 outside a hangar at the carrier's Atlanta hub on April 29, 2016. Coach class seats, seen aboard a Delta Air Lines Airbus A330 during the company's annual media day at its Atlanta hub on April 29, 2016. Delta Air Lines' first Airbus A321 narrow-body airplane rests outside a company hanagar at Atlanta Hartsfield-Jackson International Airport on April 29, 2016. The unique LED nose gear landing lights on Delta Air Lines' first Airbus A321 jet is seen at Atlanta's airport on April 29, 2016. Reporters and bloggers explore Delta's new Airbus A321 jet during a tour at Atlanta's airport on April 29, 2016. Delta's logo is seen on Bombardier's CSeries jet during a visit to Atlanta on April 29, 2016. The companies signed a deal for the jet earlier in the week. Reporters and bloggers explore Bombardier's CSeries jet during Delta's media day in Atlanta on April 29, 2016. The jet was visiting the carrier's hub following an order for at least 75 of the jet earlier in the week. Members of the media explore Bombardier's CSeries jet during Delta's media day in on April 29, 2016. The jet was visiting the carrier's hub following an order for the jet earlier in the week. Moodlighting bathes a Delta Air Lines Boeing 737-900 jet in Atlanta on April 29, 2016. Luggage bins hang down in Bombardier's CSeries jet during a tour in Atlanta on April 29, 2016. The jet was visiting the carrier's hub following an order for the jet earlier in the week. A reporter examines Bombardier's CSeries jet during Delta's media day in Atlanta on April 29, 2016. The jet was visiting the carrier's hub following an order the jet earlier in the week. Members of the media explore Bombardier's CSeries jet during Delta's media day in Atlanta on April 29, 2016. The jet was visiting the carrier's hub following an order for the jet earlier in the week. Bombardier's CSeries jet visits Atlanta Hartsfield-Jackson International Airport for media tours on April 29, 2016. Bombardier's CSeries jet visits Atlanta's airport for media tours on April 29, 2016. Bombardier pilots show Delta employees around the CSeries jet cockpit during a visit to Atlanta on April 29, 2016. Bombardier's CSeries jet visits Atlanta for media tours on April 29, 2016 following an order from Delta earlier the same week. A polished, bare-metal Douglas DC-3 in Delta livery rests in the Delta Museum adjacent to the Atlanta airport on April 29, 2016. Vintage flight attendant uniforms in a series of displays inside a converted Boeing 767-200 jet at the Delta Museum on April 29, 2016. Technician James Dow works on a Pratt & Whitney 4000 engine at Delta's TechOps facility at its Atlanta hub on April 29, 2016. An engine is readied for testing at Delta's TechOps facility at its Atlanta hub on April 29, 2016. Engines await testing in a cavernous facility at Delta's TechOps at its Atlanta hub on April 29, 2016. Wheels destined for MD-90 jets rest on the floor of at Delta's TechOps facility at its Atlanta hub on April 29, 2016. A unique set of stairs offers access to the top of the giant GE-90 engine, one of the largest in the world, on a Delta Air Lines' Boeing 777-200LR at Delta's TechOps facility in Atlanta on April 29, 2016. A Delta Air Lines' Boeing 777-200LR at Delta's TechOps facility in Atlanta on April 29, 2016. Like rows of teeth, dozens of tiny fan blades cover the exposed inner core of an engine at Delta's TechOps facility in Atlanta on April 29, 2016. A Delta Air Lines Boeing 757-200 receives modifications at Delta's TechOps facility in Atlanta on April 29, 2016. Stickers cover an employee tool box at Delta's TechOps facility in Atlanta on April 29, 2016. The first Boeing 747-400 ever owned by Delta Air Lines is towed across a road to its new home at the Delta Museum adjacent to the Atlanta airport on April 30, 2016. 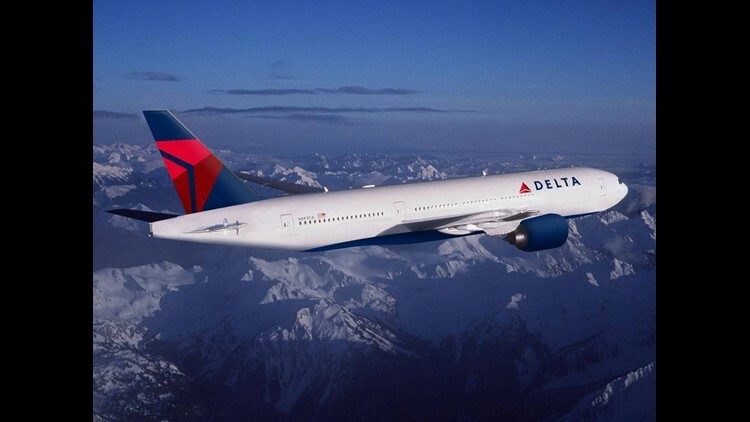 Delta plans to fly the route with Boeing 777-200ER aircraft that are set to get a cabin overhaul. That update will include Delta’s new Delta One suites and its new international-style premium economy seats. The Seoul route would become Delta’s second trans-Pacific non-stop flight from MSP. The airline already flies from MSP to Tokyo’s Haneda airport. Delta said it plans to begin flying its refurbished 777-200ERs on that route, too, starting sometime next year. For now, MSP lauded the new international link. A passenger closes a privacy door on Delta's new Delta One suites during a media demonstration flight over the U.S. Southeast on Tuesday, Oct. 17, 2017. Delta's new Delta One suites are seen after a media demonstration flight over the U.S. Southeast on Tuesday, Oct. 17, 2017. Noise-cancelling headphones offered for use by Delta are seen hanging in a stylized compartment in the carrier's new Delta One suites on Oct. 17, 2017. Passengers, mostly members of the media, disembark a Delta Airbus A350 after a demonstration flight over the U.S. Southeast on Tuesday, Oct. 17, 2017. Seat and suite seetings in the Delta's new Delta One suites. A passenger opens a privacy door on Delta's new Delta One suites during a media demonstration flight over the U.S. Southeast on Tuesday, Oct. 17, 2017. Delta's Premium Select international-style premium econoy seats are seen during a media demonstration flight over the U.S. Southeast on Tuesday, Oct. 17, 2017. A control pane for Delta's Premium Select international-style premium econoy seats is seen during a media demonstration flight over the U.S. Southeast on Tuesday, Oct. 17, 2017. The cockpit of Delta's new Airbus A350 widebody jet is seen in Atlanta on Oct. 17, 2017. Delta's new international-style premium economy cabin is arranged in a 2-4-2 layout. Delta's new Delta One suites have a “Do Not Disturb” button. When activated, seat numbers turn red. And when they're turned off, the numbers on the Delta One suites turn green, letting attendants know it's OK to come by to see if service is wanted. A seat-back entertainment screen shows the path of Delta's two-hour Airbus A350 demonstration flight on Oct. 17, 2017. This handout photo provided by Delta shows what its Delta One suites look like when reclined into a lie-flat bed. A Delta Airbus A350 is towed to a hangar in Atlanta after a demonstration flight over the U.S. Southeast on Tuesday, Oct. 17, 2017. The economy cabin on Delta's new Airbus A350 is seen during a media demonstration flight over the U.S. Southeast on Tuesday, Oct. 17, 2017. Delta's new international-style premoum economy cabin is seen after a media demonstration flight over the U.S. Southeast on Tuesday, Oct. 17, 2017. As with Boeing's 787, larger-than-normal windows are a hallmark of Airbus' A350 model. Seen here is the pre-takeoff view from a Delta demonstration flight on the A350 on Oct. 17, 2017. Delta's new international-style premoum economy cabin is seen during a media demonstration flight over the U.S. Southeast on Tuesday, Oct. 17, 2017. Delta's new Delta One suites are during a media demonstration flight over the U.S. Southeast on Tuesday, Oct. 17, 2017. Chef James Beard, recipient of a James Beard award, talks about items he's helped prepare for Delta's menu for its new Delta One suites. Food items 'inspired' by Delta's new Delta One suites menu are shown to visitors ahead of a special Airbus A350 demonstration flight on Oct. 17, 2017. Delta's new international-style premium economy cabin offer space and legroom that try to split the difference between economy and business class. Large seat-back in-flight entertainment screens and increased foot space are among the hallmarks of Delta’s new Delta One suites on its Airbus A350. Seat and suite settings in the Delta's new Delta One suites. Increased legroom and storage space are among the hallmarks of Delta’s new Delta One suites on its Airbus A350. The gallery in the middle of Delta's new Airbus A350 is seen during a media demonstration flight over the U.S. Southeast on Tuesday, Oct. 17, 2017. Delta's new international-style premium economy cabin is seen during a media demonstration flight over the U.S. Southeast on Tuesday, Oct. 17, 2017. Seat-back entertainment screens are seen in Delta's new international-style premium economy cabin. The tray table (and release button) are seen at Premium Select international-style premium economy seat on Delta's new Airbus A350. Delta's new Airbus A350 sits outside a hangar in Atlanta after a special demonstration flight on Oct. 17, 2017. The cockpit of Delta's new Airbus A350 is seen in Atlanta after a demonstration flight on Oct. 17, 2017. Delta's Premium Select international-style premium economy seats are seen during a media demonstration flight over the U.S. Southeast on Tuesday, Oct. 17, 2017. The view from atop an economy seat on Delta's new Airbus A350. The view from above an economy seat on Delta's new Airbus A350. A lavatory on Delta's new Airbus A350 is seen during a media demonstration flight over the U.S. Southeast on Tuesday, Oct. 17, 2017. A bin is opened to show overhead storage space on Delta's Airbus A350 demonstration flight on Oct. 17, 2017. Delta's new international-style premium economy cabin is seen after a media demonstration flight over the U.S. Southeast on Tuesday, Oct. 17, 2017. Visitors settle in on a Delta demonstration flight with its new Airbus A350 on Oct. 17, 2017. The view from on board a Delta Airbus A350 demonstration flight over the U.S. Southeast on Tuesday, Oct. 17, 2017. Here, a raised privacy screen shows how it encloses a passenger in a Delta One suite on a special demonstration flight on Oct. 17, 2017. 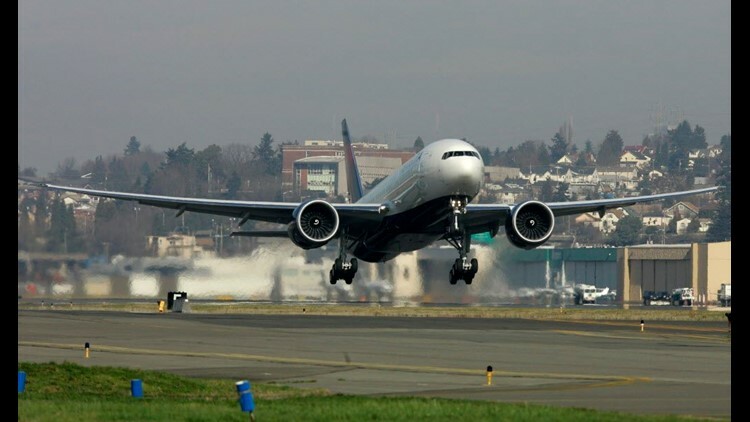 A new Boeing 777-200 LR purchased by Delta Air Lines Inc. takes off Feb. 29, 2008, from Boeing Field in Seattle.